WASHINGTON — In just two years, Crosby S. Noyes Education Campus went from a school deemed in need of improvement to a place that the District of Columbia Public Schools called one of its "shining stars." Standardized test scores improved dramatically. In 2006, only 10% of Noyes' students scored "proficient" or "advanced" in math on the standardized tests required by the federal No Child Left Behind law. Two years later, 58% achieved that level. The school showed similar gains in reading. Because of the remarkable turnaround, the U.S. Department of Education named the school in northeast Washington a National Blue Ribbon School. Noyes was one of 264 public schools nationwide given that award in 2009. 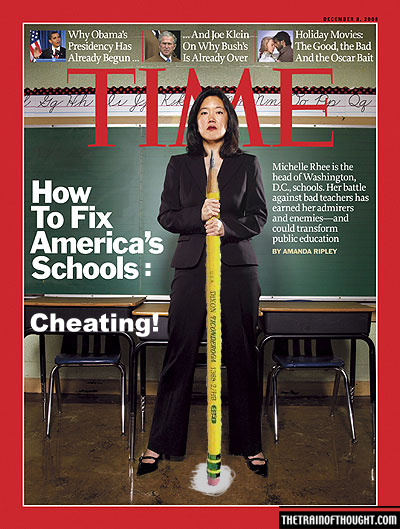 Michelle Rhee, then chancellor of D.C. schools, took a special interest in Noyes. She touted the school, which now serves preschoolers through eighth-graders, as an example of how the sweeping changes she championed could transform even the lowest-performing Washington schools. Twice in three years, she rewarded Noyes' staff for boosting scores: In 2008 and again in 2010, each teacher won an $8,000 bonus, and the principal won $10,000. A closer look at Noyes, however, raises questions about its test scores from 2006 to 2010. Its proficiency rates rose at a much faster rate than the average for D.C. schools. Then, in 2010, when scores dipped for most of the district's elementary schools, Noyes' proficiency rates fell further than average. "It isn't surprising," Rhee said in a statement Monday, "that the enemies of school reform once again are trying to argue that the Earth is flat and that there is no way test scores could have improved ... unless someone cheated." No, Michelle. Flat-earthers follow faith, not evidence. Just as you are doing by trying to cast this as your reform or no reform, good guys and bad guys, evidence be damned. Let's review: Noted enemy of school reform McGraw-Hill, which scores the test sheets, flagged the pattern. Fringe left publication USA Today investigated it—unlike your administration, which conducted only the most cursory investigation and that belatedly. And academics at Arizona State University, Georgetown University, and Western Michigan University agreed that the pattern called for thorough examination. Or it could be that Rhee simply has terrible ideas about education reform, but will always get new school systems to destroy because her driving principle is one that everyone that from Bill Gates to Arne Duncan can agree on: union busting. Well, the unions didn't come back with an answer to the problem for so many decades that someone was appointed to make changes, and the union didn't work with her, even then. At some point, one has to acknowledge when there's a problem and work to resolve it. The great thing about Daily Kos picking this up is that Michelle will see it--if she doesn't, somebody she knows will. AND it will make her furious!